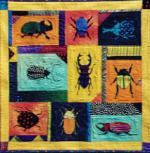 This pattern is available as a printed pattern or a downloadable PDF. 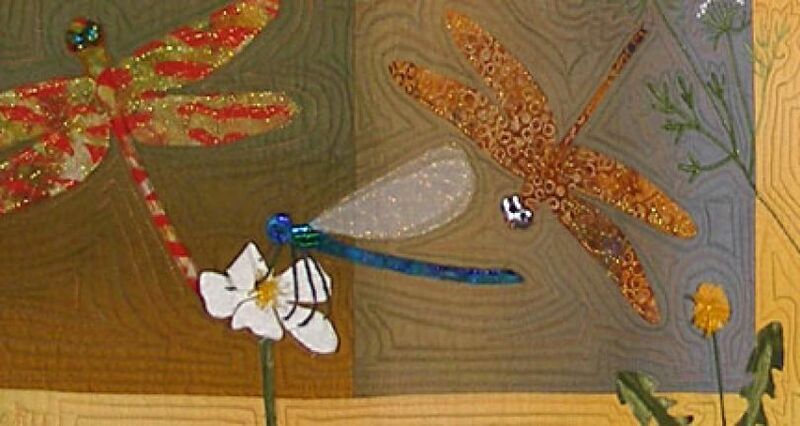 It consists of two dragonfly drawings and several flowers to embroider by had or on the sewing machine, some with hand beading. The finished quilt is 22.5" square. I used pearlescent Sliver (tinsel-like) thread from Sulky for the lines on the wings, so it sparkles. 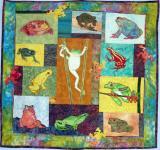 The machine quilting is done with variegated rayon thread in soft colors of brown, green, pink and gray. It echoes around all the designs. The stitching is all raw edge applique, which is straight stitching close to the edges of the fused appliques. The fabrics for the blocks and border are shaded in two different colorways. 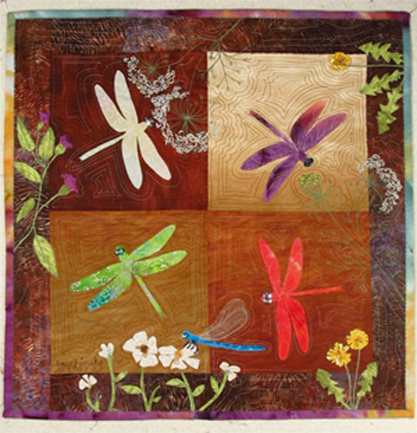 The dragonflies are batiks scraps. I used variegated threads on two of their elongated bodies, which look like the segments on their abdomens. I used white seed beads for the Queen Anne's Lace and dandelion, going to seed, and yellow seed beads for the dandelion, three different purple threads for the thistle flowers. You could use French knots for the Queen Anne's Lace. I couldn't find pearl cotton in white in my stash, but I did find some great tear drop chartreuse beads for the not-quite-open flower which I combined with seed beads in opaque moss green. In this PDF pattern we added two color photos of close up details. When you order a PDF pattern, the download location will be sent within 24 hours of placing your order. PDF patterns ar not available to wholesale customers. I am made a new sample for this pattern. Since I never make a quilt the same way twice, I added some petal shapes and stems and made a group of white flowers. Some one actually insisted that because I changed it, I need to make a new pattern! These are the little changes you can make to alter the pattern to make it your own. Detail of the quilt on the cover of the pattern. 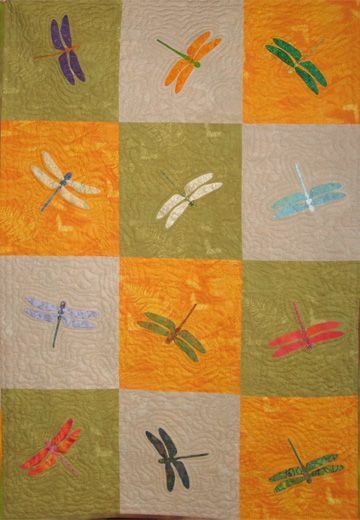 This quilt was made by Pat Winterrowd in January 2009. It was made as a gift for a new baby, completed in about a month's time, including having it professionally machine quilted. 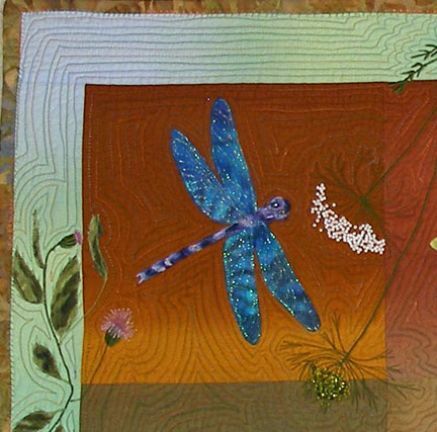 The baby's parents want her to be wrapped in dragonflies.